This chevron scarf pattern has a lot of possibilities! 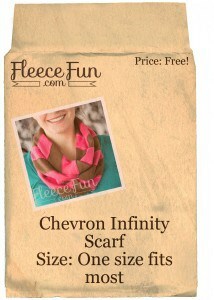 You can make an infinity scarf with a trendy chevron pattern! Learn the process on how to make a chevron and apply it to other projects. Print up the pattern. The pattern is to scale so no assembly is needed. You will have three pattern pieces. Be sure to wash and dry the jersey knit before you begin to cut and sew. Step 2- Sew together the strips. Basically you are going to build your own striped pattern. 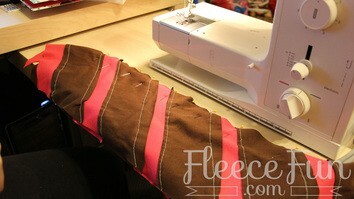 Placing color 1 (pink) on top of color two (brown) (so wrong side to right side) have the fabric overlap .5 inches. Pin. Then top stitch .25 inches away from edge of color 1 the length of the strips. Repeat until all the strips are sewn together. Tip: Use contrasting thread to make the top stitching pop and add character to your scarf. Yup. That’s right time to slice through that pretty fabric you just made. Read through this step a couple times and make sure you understand before proceeding! Using the “Amazing Chevron maker” and Super line straightener 2″ plus your ruler, and rotary cutter you will make the strips you need to make the chevron look. 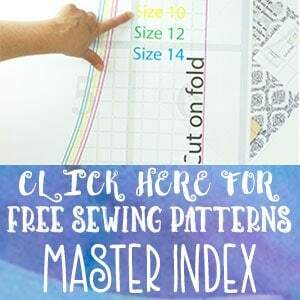 Place the Amazing chevron maker on the bottom of the fabric Line up the ruler with the angle of the Triangle and cut. 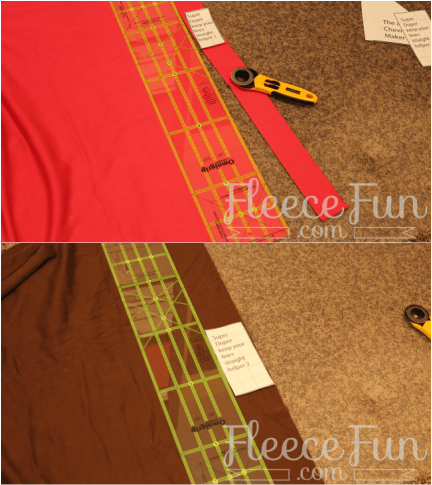 Then using the height of the super straightener 2 to measure the width of the cut (see picture) and using the angle cut the fabric again to make the stripe of fabric. Cut 2 more strips at this angle. Then flip triangle over (words are facing down (touching the mat) and cut 3 strips using this same method. It’s the cloth meeting at the two angles that makes the pattern. I will warn you I have no perfect method here – this will require independent thinking on your part! Taking the piece you cut, layout the scarf. You will need to trim colors to get the pattern to line up perfectly. 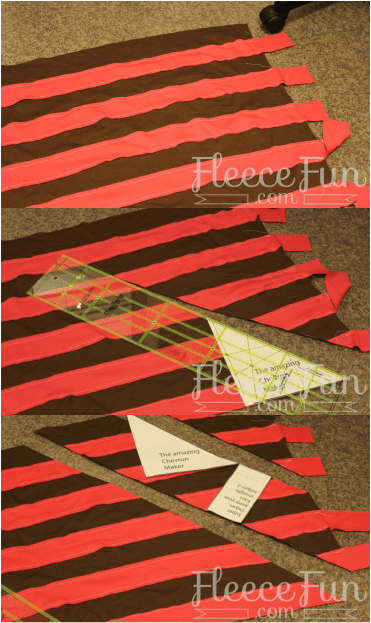 Lay the whole thing out and try strips in different places to get the most out of your scarf. See that lovely chevron pattern coming into place? Once you have laid out your scarf. You will need to assemble it so the pattern is correct. 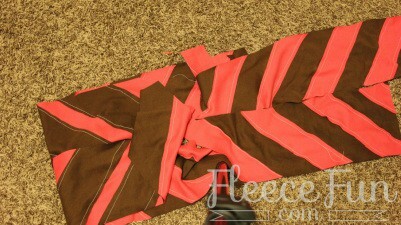 Sew together all the sections of the chevron you can- right sides together using a .25 seam allowance. 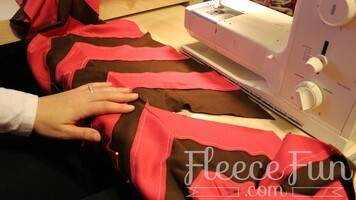 Then sew together each section so the pattern is seamless – using the same top stitching method you used before. Make sure the ends of the scarf line up BUT – Don’t close the loop yet – make sure the ends of the scarf aren’t sewn together. That comes later. Pin together (right sides together) to make the chevron pattern first sew one side then the together using a .25 seam allowance. So you have a long tube. Turn right side out. Linking up the end of the scarf to the beginning, top stitch closed what you can using the machine, then using a needle and thread blind hand top stitch the gap closed – taking care to only get the top layers and not the other side of the scarf. Thanks for the cute tutorial! I can’t wait to get my scarf finished. I am a little confused about some of the assembly steps though (I can’t get the video to load on my mac). Can you clarify for me? In step 5 are you sewing the long edges together or the shorter strips to make the long strips? The picture looks like you might have sewn the long edge first then the shorter strips so I’m a bit confused by the “sew all the strips you can” comment. 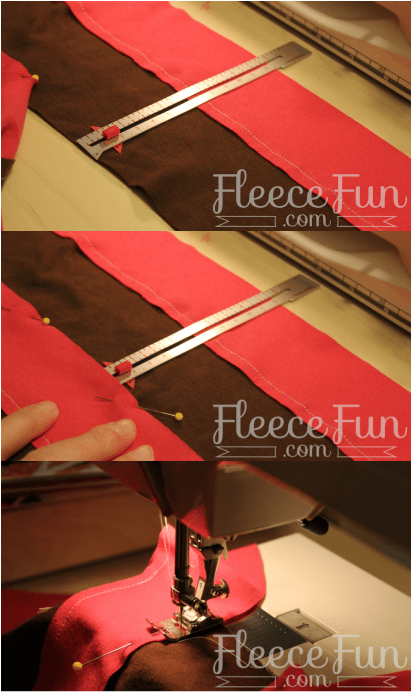 And in step 6, are you sewing both long edges together? Thanks so much! All of my videos are also on yourtube – here is the scarf http://youtu.be/QXz771MWLPQ. See if this helps. So I have a question regarding #3 and #3b. 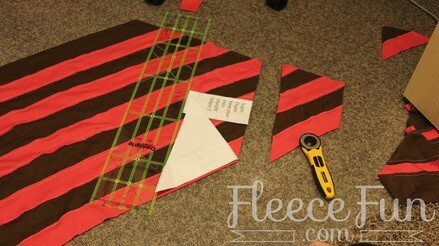 Does this step, of cutting the angled strips, use up the original piece that was all sewed together? I’m trying to picture this step in my head, and I’m not having much luck. Yes you are cutting up the fabric you just sewed together. 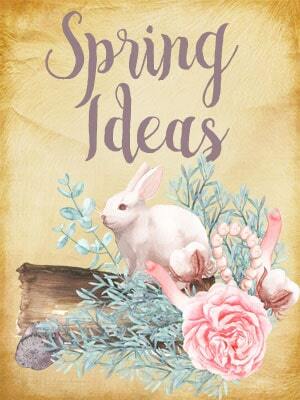 Thank you for sharing this awesome idea. I found a nice fleece coat pattern (Simplicity 1540) I will try to make for my daughter as a gift and this scarf will compliment it very well. Thank you so much. 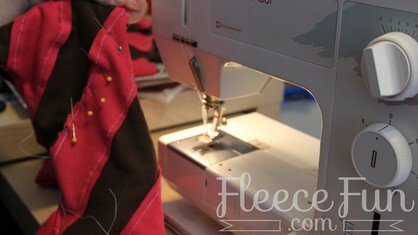 Yes krissie fleece will work!